Thank you for improving the health of my son. A cough seems like a singular thing, but his constant cough affected his energy, his school work and my attendance at work. It is such a relief to have a healthy family again. Propolis Vaporizers sanitize the respiratory tract and helps individuals that suffer from respiratory ailments. Propolis contains volatile essential oils that provide infection protection from the flu and other ORL diseases. Le diffuseur de propolis Propolair Car® permet de diffuser la propolis dans l’habitacle duvéhicule. D’utilisation simple, il se branche sur l’allume-cigare et permet de bénéficier desbienfaits de la propolis dans sa voiture. En effet, la propolis contient des huiles essentiellesvolatiles qui présentent des activités anti-infectieuses utiles en cas de grippes et de pathologiesORL diverses. De manière pratique, le diffuseur permet de créer une atmosphère agréable dans l’habitacle tout en assainissant les voies respiratoires des passagers : il est donc particulièrement indiqué pour les personnes faisant de longs trajets quotidiens et qui souffrent de pathologies respiratoires diverses. Thank you for working with me this AM. I truly appreciate it. I own 3 propolis machines and there are 4 more at my office (they are ordered on another name). I have recommended the product to several people. I know that at least 3 of them now use the product - one of them has a machine in every room of her house. One of the people is MCS and uses the organic propolis refills. Thanks again. I look forward to receiving and using your wonderful products. I especially appreciate the personal attention you gave me while here in Italy.What outstanding customer service. "Thanks, you have some great products!" I never did get a chance to say thank you so much for your amazing customer service, and wonderful products!!! I hope to order again soon, and thanks again.. Thank you for working with me this AM. I truly appreciate it. I own 3 propolis machines and there are 4 more at my office (they are ordered on another name). I have recommended the product to several people. I know that at least 3 of them now use the product - one of them has a machine in every room of her house. One of the people is MCS and uses the organic propolis refills. Thanks again." "I love the vaporizer- it has changed my life- I am now on a roadtrip and I use it in the motel nightly and it has been amazing. So is the propolis nasal spray." "My office feels like a different place now. I was nervous about the smell it might give off, but it is truly an indescribable smell. Like a fresh day..."
"The vaporizers are wonderful. Can you please send one more?" 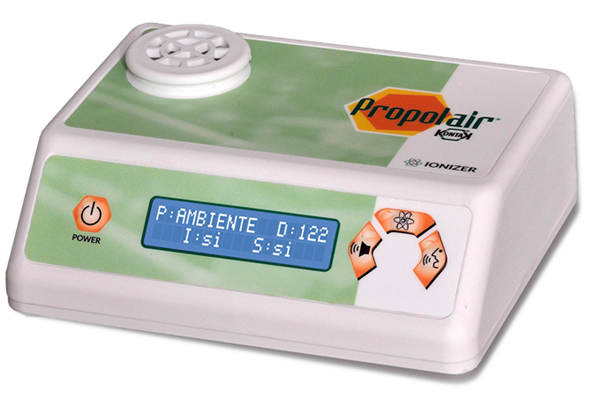 "Am running the Propolair's today - I love the smell..."
"For over 35 years I have been interested in propolis and wrote three books in Spanish on it ("Propolis, A Valuable Bee Product" in 1979, "Propolis, the Purple Gold of Bees" in 1988, 1991 and 2005, and "Cuban Research on Propolis" in 1988), and propolis is a very effective antibacterial and anti-inflammatory agent. It's antiseptic capacities are effective against numerous bacteria, viruses and fungi. "As a family medical practitioner I know my office is exposed to numerous microbes, viruses and even mold daily. I cannot think of a better 24/7 solution to naturally sanitize my office and improve my breathing than with a propolis vaporizer. The importance of the propolis (excellent for the lungs and immune system) is its complementary functionality with other treatments. From acupuncture to ayurveda and homeopathy to naturopathy, it is a valuable link to any holistic/integrative protocol." Heather Flynn Plude I use propolis in a diffuser... I think I got it from BeeHealthy Farms. Dr. Klinghardt recommends it... can't remember the reference but I feel it helps. 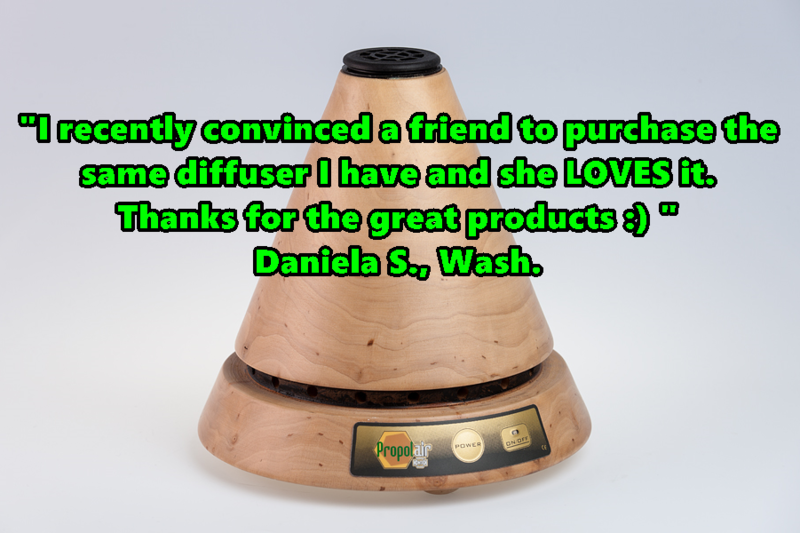 "We are very satisfied with the mold reducing capability of the propolis diffuser that we purchased from you. After using the unit for 3 weeks we turned it off for a day and then re-tested the room and it was virtually mold free. The previous test we had done had produced a petri dish full of 40 or so mold spots of growth which told us we had a problem as reported to us by the testing lab. After using the unit for 3 weeks the next petri dish had only two spots of mold which is far less than even the outside air in New Orleans where we live. Thanks so much for a great product that is also chemical free and 'green' to boot." "I often do not comment to my suppliers about the products I purchase for my practice but I would love to recommend the Bee Healthy Farms propolis diffusers to everyone. All of my clients just love the natural benefits that they have experienced from using the Bee Healthy Farms propolis diffusers. Many of my allergy suffering clients have experienced tremendous relief. I have also found that this unit addressed many of their home air pollutants which are contributors to air quality problems. The units are easy to use and very reliable. The pleasant smell of the propolis that is dispersed from the unit is very soothing. I think every household should have one of these units. I have sold hundreds of these units to my client patients and each has been thrilled with the benefits of this unit." Thank you Bee Healthy Farms for such an excellent product! "The propolis came a little while ago and I really love having it in my workspace. I see a lot of children in my practice and they often come in with who knows what kind of bugs. You could market it as a wonderful non-invasive anti-flu measure." Propolia: My entire life, I’ve battled with allergic rhinitis (aka hayfever/allergies). Ragweed, pollen, oak, cats, the whole gambit. As I’ve grown older, my symptoms have calmed down some, but when I am exposed to allergens: sneeze, runny nose, sniffles. Sometimes it’s embarrassing, others it prevents me from working. I’ve tried a noteworthy number of prescription meds, over the counter preparations, naturopathic remedies, sprays, you name it I’ve tried it. Propolia nasal spray is to date the very best of any product I’ve ever tried. One spray up each nostril per instructions, and my symptoms went to minimum within 10 minutes. It seems to last from 1-6 hours before I need another dose, if needed at all that day. There’s a little nasal drip after you take the spray, but not objectionable. I tried it on my four year old son when he had a common cold, and he did not care for getting a spray up his nose, BUT: his non-stop sneeze/sniffle almost completely stopped. Every person’s metabolism and conditions are different, but for me this is the finest product I’ve ever used. Last, look at the ingredients. There is not a single objectionable ingredient in this formulation. 99.5% organic sourcing. Bottom line: this is the best product for hayfever/allergies/sniffles/sneezes/rhinitis I’ve ever seen. As a side note, we continue to love the propol air capsules and nasal spray. I also, had an amazing healing with the suppositories (after 1 and a half years of trying just about everything). "I have very positive feedback from the propolis suppositories and one girl was able to reverse her chronic pre-cancerous cervical dysplasia and is beyond thrilled." I was so glad to find your site, after thinking I had long since seen every propolis related one on the web. It is fun, and you have attempted to make it enriched with many aspects. I am a huge fan of propolis and have used it since late '70's. I am very excited about the diffusers, and will save up for most versatile model! Congratulations on a great life's work and wonderful product line. Will you please send me 500 tablets of Vegetarian Propolis tablets, 500 mg in bulk bags of 100ct tablets? You might appreciate to know that my neighbour, whom I supply, cures her dogs and horses with Propolis. "I give my boy at least two sticks of honey of yours everyday now. He looks superior than others at least I think.^^ "